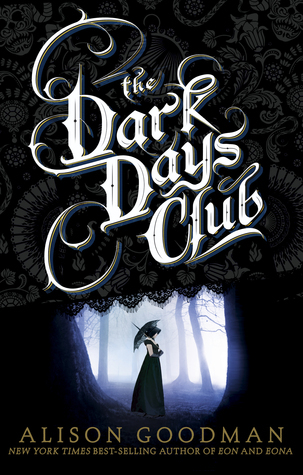 Reading Alison Goodman's new YA novel The Dark Days Club is a bit like eating a ten course meal: the individual elements were delicious, but eventually I found myself too full to properly appreciate them. Goodman's heroine is Lady Helen Wrexhall, a wealthy young woman whose fortune barely makes up for her family's scandalous past. As Helen prepares for the social season of 1812, her uncle constantly reminds her that she must never speak positively of her parents, an allegedly treasonous couple who died at sea. Helen does her best to hide the restless intelligence she inherited from her mother, but when one of the housemaids goes missing she decides to investigate the situation. Her search leads her to Lord Carlston, a mysterious man who introduces her to a world of supernatural horrors. Unfortunately for Helen, the threat of social ruin is nearly as dangerous as a tentacle-wielding demon, and she finds herself torn between a dangerous calling and a safe but smothering future. To be fair, nothing about The Dark Days Club actually needs to be cut. Goodman is an enthusiastic researcher, and her story is heavily embellished with historical facts and interesting asides*. I do wish she had streamlined some of the supernatural details: I usually approve of authors establishing clear rules early in their series (particularly if the alternative is trotting out a hitherto unheard-of talent at the end of every book, just in time to save the day), but there's too much to keep track of in this installment. Sure, many of these details are clever, but some judicious editing would have given the most interesting element of The Dark Days Club—the very real dangers facing “ruined” young women in Regency England—a heftier punch. *Personally, I could have lived without the many, many tidbits about Regency-era bathroom habits, but that's just me.